Open to all early stage tech startups in Cebu. Submit your online application now. Deadline of submission is on June 25, 2107. It's been said that pitching does not guarantee that a startup will get funded. That may be true. But pitching in a public venue will get you publicity, support, and feedback from the community. Get noticed by potential partners, supporters and customers. If you do it right, you may get noticed by someone who may recommend you to THE ONE. Having a good product to begin with and a solid startup team will increase your chances of success. Building a relationship with the right mentor or investor who understands your niche is another way to boost your chances. The more you pitch, the more you will ensure that your product meets stringent public expectations. Know what makes your startup rise above the noise, speak the right language to your target audience, and good luck! 2. Wait for email confirmation of your entry. The submission period begins on June 9, 2017 at 12:00 AM PH Time, and ends on June 25, 2017 at 23:59 PH Time. All applications must be reviewed by TechTalks.ph team for shortlisting. All shortlisted applications will be notified on or before June 27, 2017 for a mentoring session to be done prior to the Pitchfest, between June 28-July 5, 2017. More details will be provided to the shortlisted applications. 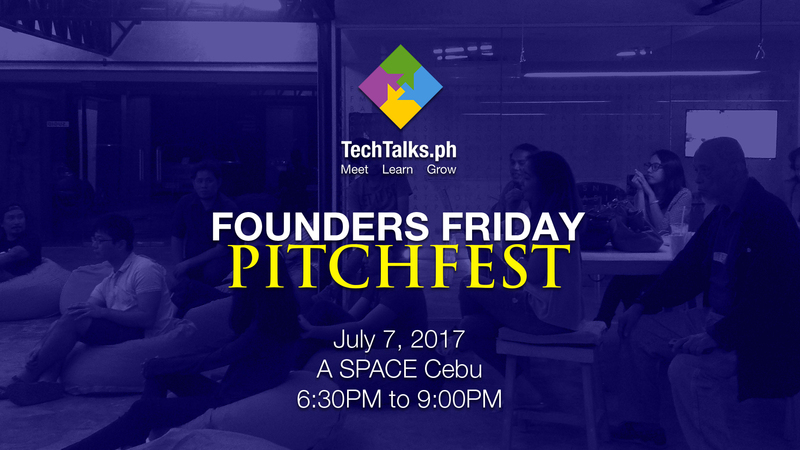 Pitchfest will be done on July 6, 2017; 6PM at A Space Cebu, Crossroads, Banilad. Does the project have a clear target market or audience? Does the project address a clear need, problem, or opportunity and is the solution clearly explained? Does the project create a new category of product or service? If there are similar products or services on the market, does the project clearly and meaningfully innovate beyond those existing products or services? Does the project present a new and meaningfully improved way of accomplishing something? Does the project include innovations in user experience? Does the project include innovations in technical design and/or implementation? Does the project perform well and respond crisply to input? Does the project make effective and appropriate use of the major features of its chosen platform(s)? Were there significant platform features or even platforms the project could have benefitted from but failed to utilize? Does the team have a credible plan for getting their project to market in terms of business model, any required partnerships, or other factors? Does the team have any form of external validation for their project such as customer surveys, focus group tests, an active beta-test program, recommendations from subject-matter experts, or potential investors? Does the project have a reasonable chance of success in its appropriate market given the team’s existing plan? Win Ticket to attend Geeks on A Beach at Puerto Princesa, Palawan on August 24-25, 2017. Open to all interested parties but most especially Startup Founders, aspiring tech entrepreneurs, and all those who are serious about starting a business in the web, mobile or tech industry. Also inviting Business/Tech leaders, innovators and others who can mentor startups and serve as angel investors. Business owners who want to learn more about tech startups for partnership and/or investment are also welcome. You don't need to have a startup now to join this group. Students, Academe, all who support innovation and new types of businesses are all welcome. A passion for entrepreneurship and willingness to share what you know is critical. Please update your LinkedIn profile to facilitate networking. For questions, you can contact us via email - info@techtalks.ph or phone call - +639-15-481-7703.